I think we have this mentality that to change the world, you have to toss everything you know and love out the window and become a completely different person. I have no doubt Christie would tell you she is a different person now that when she began this journey, but I would argue it was the journey itself that changed her, not an overnight sensation or decision to abandon all familiarity or security. She stepped out, took a risk, and continues to do so with each new girl she takes into The Learning Tea program or trip she takes to India. Her determination to help despite her own limited resources or lack of experience in international aid programs really challenged me. Christie's memoir is fun and frank. I knew from the very start I was going to like it. She won me over with a Harry Potter reference on page 8, though her self-abasing and service promoting style captured me from page 1. She does not glamorize her work, nor does she, I'm sure, share the darkest details. Rather, she strikes an honest balance that helps the reader see the realities of her work without losing the importance or beauty of the big picture mission. I have to say, this was a really timely read for me, not only because I have become increasingly interested in the topic of girls' education lately, but also because I have a very dear cousin (you know Jamie!) 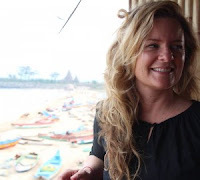 who is studying yoga in the very region of India that Christie's work happens. Reading Christie's descriptions of India made me feel as though I can understand better the experiences that Jamie is having over there right now. Also, I really want to check out Christie's Atlanta tea shop whenever we get over there. It sounds right up my alley for so many reasons. Thanks to TLC Book Tours, I have the chance to share a short Q&A with Christie herself here! I always love having the opportunity to do this because I think it adds a nice behind-the-scenes glimpse into an author's perspective and personality. Q: Where did the title Tiger Heart come from? 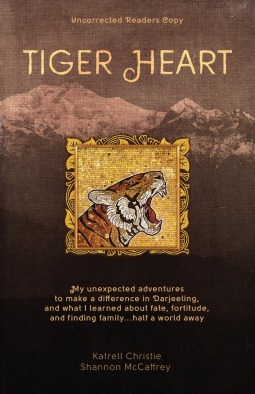 A: One of the young women in my project in Darjeeling gave me the nickname Tiger Heart because she said it represented strength and compassion. The girls liked the name – tigers have a lot of powerful symbolism in India – and it stuck. Q: How did you model your project The Learning Tea? A: I’m inspired by philanthropic ventures like Tom’s and Newman’s Own. They are able to run a business and also contribute to a greater good. That’s what I’m after with The Learning Tea. People can buy their coffee or tea lots of different places. When they choose my shop, they know they are helping educate young female college students in India. Q: What do you think of the Indian people? A: I am blown away again and again by how giving they can be, especially when they often have so little. They live right in the moment and enjoy an uncomplicated happiness that leaves me in awe. Q: What do you hope readers take from the book? A: That they can make a difference, even in a very small way, by the choices that they make. And that happiness can come from helping others. It’s amazing how good it can make you feel to see a smile on someone’s face and know you played a part in putting it there. Q: I have to ask - what is your favorite tea? Q: Not including your own work, do you have a book recommendation for myself and my readers? A: Barrel Fever by David Sedaris. It's just funny. It makes me laugh every time I pick it up. And, the short stories are so accessible and great. Laughter is medicine, after all. Thanks for taking the time to answer the questions, Katrell! I look forward to following the mission and progress of The Learning Tea and will definitely stop by Dr. Bombay's next time I'm in Atlanta. A Reduced Review: Tiger Heart shows both the sometimes grim realities of international aid work while also exemplifying the beauty of hope it can bring. "She's a very normal person doing something extraordinary, and we do not see enough of that." I couldn't agree more! What an inspiration!